Chicago is still “a wonderful town.” Early this summer, my travels took me there and I spent some time wandering about. Here is my report. Skydeck Ledge looks out from 1353 feet high at the Sears Tower, is still a skyscraper to impress and the observatory still provides incredible views. (I learned the Sears Tower is now called the Willis Tower). This was the tallest building in the world when I was growing up. In 2004, a Japanese skyscraper surpassed it and now others in the world have reached even higher. But at a certain point, tall is tall, no matter the measurement. On the architectural boat tour, the conductor said that twenty percent of the world’s water is in the Great Lakes. I keep meaning to do some fact checking. 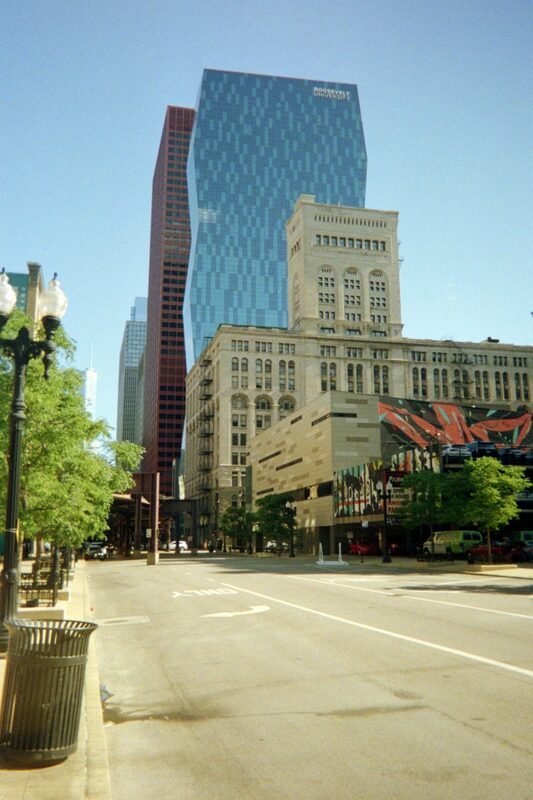 Architectural tours in Chicago have always been a favorite of mine, but it now seems the housing boom of large and tall condominium buildings is obstructing many of the once great architectural river views. 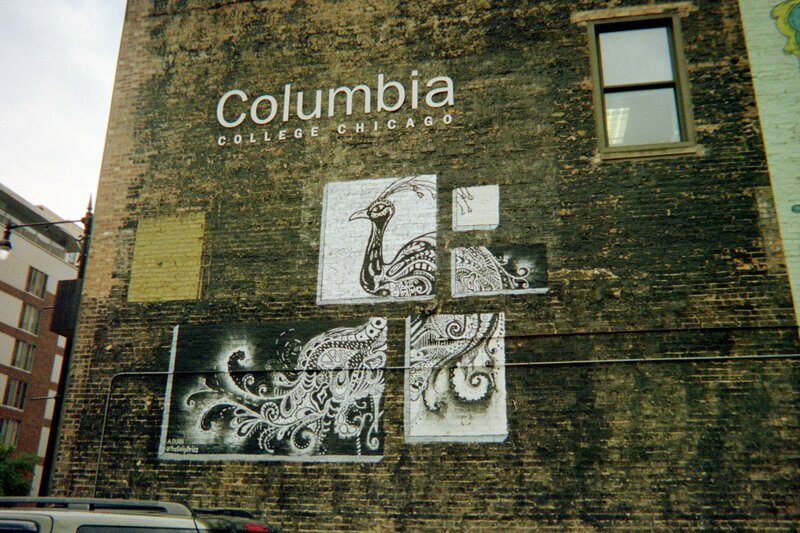 The centrally located Hosteling International Chicago has an adjacent Cuban Cafe. 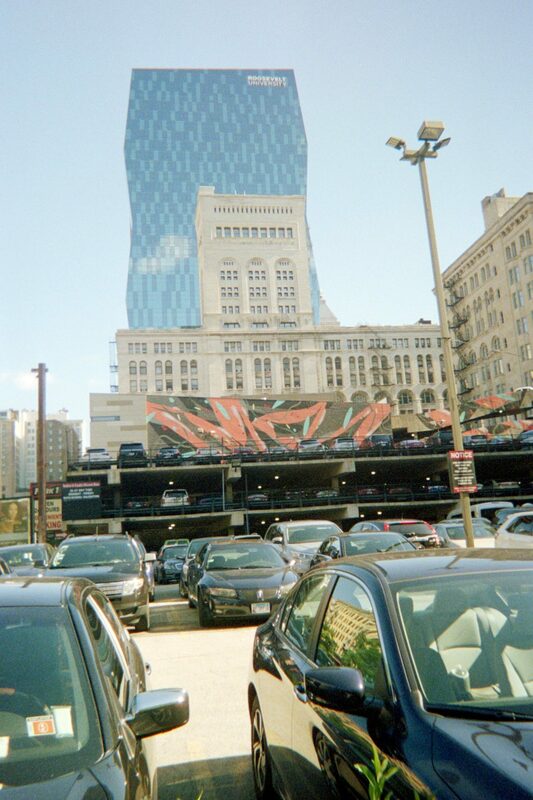 Near the hostel is the Harold Washington Library; a worthwhile photo exhibit was showing when I was there. This library is a great building, inside and out. I published my Saturday post using the library computer hall. The nearby Expo Burger wouldn’t take my cash; I was told it had been losing too much money at the bank because there were taking in much counterfeit cash. Now cash is not accepted! The Green Mill is an historic jazz bar that was frequented by Al Capone and Charlie Chaplin! There is a tunnel behind bar that was used by Al to elude the police; it would come out at a dance floor a few blocks down the street. The music that night was very fine. As I listened, I noted the deep wooden picture frames gave depth to the wall paintings themselves. The Green Mill is set in the former “Hollywood” area of town. (Charlie Chaplin moved film industry to LA when Chicago insisted on nickel and dime-ing him for every little thing.) And I recommend ordering an Al Pastore Burrito (pork with pineapple) just a few doors down the street from the Green Mill. 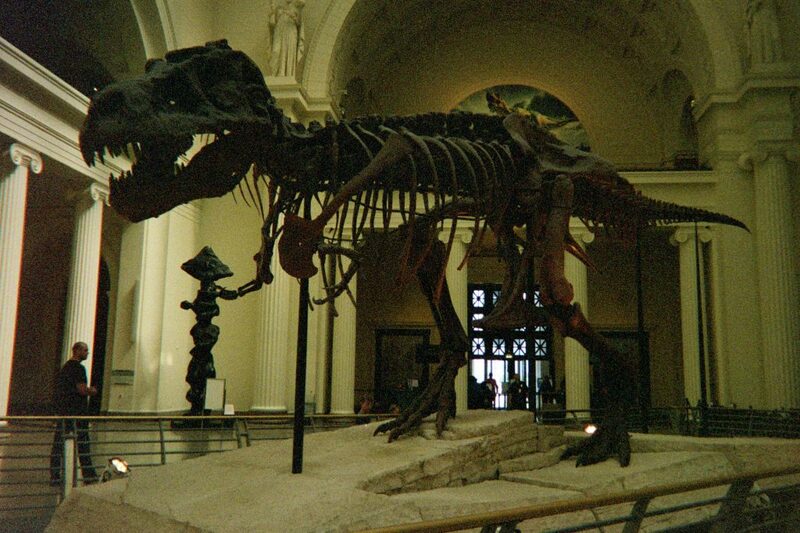 Being me, I had to spend hours at the Field Museum of Natural History. The Burgess Shale exhibit included three adjacent video screens, depicting life in the sea when those fossils lived (in the Cambrian Era). I found the Polynesian exhibits that had always intrigued me have been so muted that I found them boring. The huge dinosaur skeletons still stand. The special exhibit on Jurassic Park was well worth the time. The Shedd Aquarium has never thrilled me. It could be so much better. (As I go to the local aquariums everywhere, I always check it out.) I did enjoy the red-winged blackbirds flying about while I waited in line for a ticket. It is alongside Grant Park which I have always found to be lovely; I like to sit and look out at the boats on Lake Michigan. It was there I skimmed through Condola Rice’s book urging people to remain steadfast in their faith in democracy. Chicago is famous for its deep dish pizza. My favorite is Giordano’s “stuffed” pizza. I ordered my pizza with the local beer, “Revolution anti hero IPA.” I sat at the bar chatting with two sisters visiting from Columbia. Cosmopolitan Chicago! A sign at the bar said: “Pizza is not a matter of life or death. It is much more important than that.” I couldn’t disagree. I got yet another garnet ring, this one at the Chicago Hilton Lobby. Why was I there? This hotel opened in 1927 and over the years has hosted Babe Ruth, Joe DiMaggio and Emelia Earhart and JFK. I intended to stroll the lobby. Money works best when you spread it around anyway. Perhaps it was to make me feel better about not having time to visit the zoo. 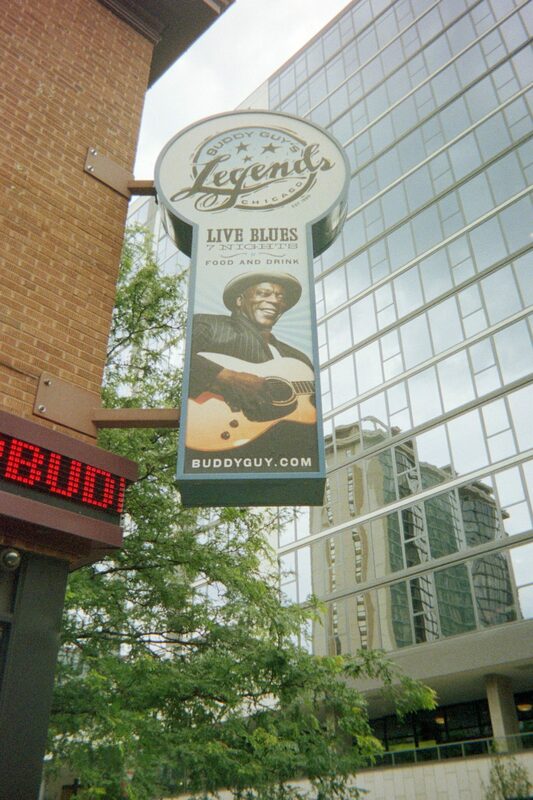 Just a block away from the Hilton is Buddy Guy’s Legends (established in 1989). It was too late for me but I got the signature drink and a front and center table when there was a standing crowd. (Never hesitate to walk up when it looks like people are leaving. Those who joined me were from Georgia.) A fine blues band was playing. Then it got even better. After some sets, Buddy Guy, himself, got up and sang a song with the band. Such a stellar entertainer! Before leaving the stage, he told the crowd, “These guys have a bucket up here and it’s not for ice.” What a treat! The Art Institute of Chicago is still top shelf in my book. If you are a walker, you will find much interesting street art in this city. 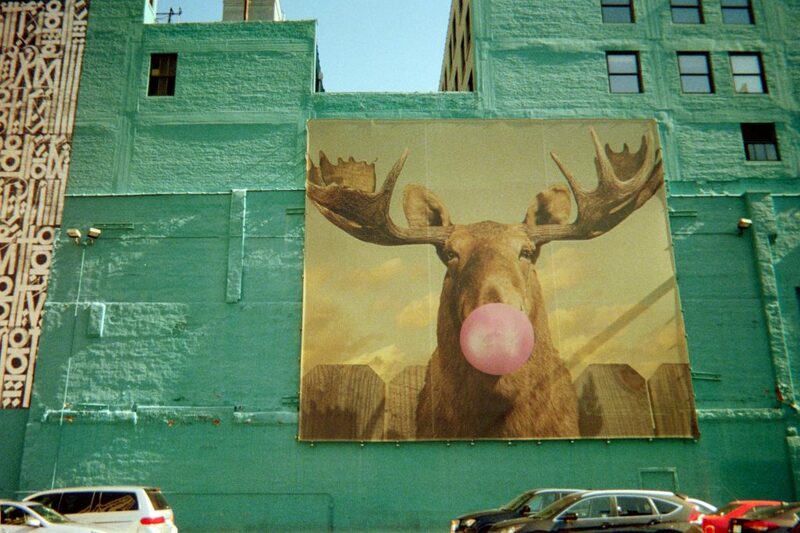 Near the art school, there was a moose blowing a bubble. 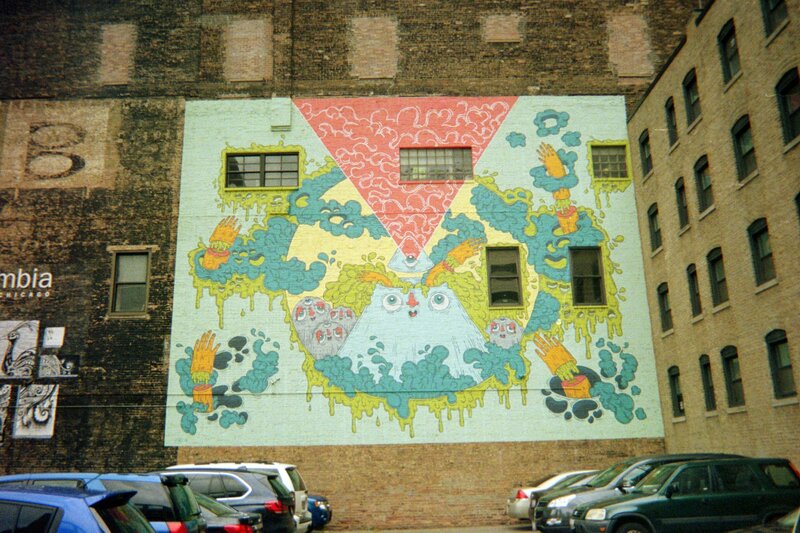 I got so excited about so much of this street art that I purchased a disposable camera to record some of it. But as usual, I didn’t always have a camera when I saw what I wanted to photograph. Ah, the perils of not using a cellular telephone. 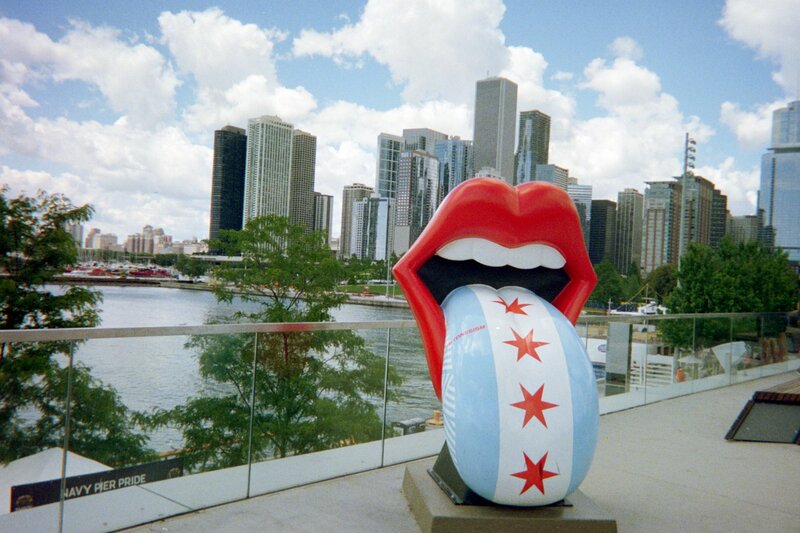 Beware the tourist traps and you will likely enjoy a trip to Chicago too. But I don’t totally regret those either. At the “The Rolling Stones Exhibitionism” exhibit at Navy Pier, I sang along with about 20 other people in a room meant to replicate a concert experience. At the Tommy Guns dinner theatre in the South Loop, I tried aiming with a tommy gun! You never know until you try.